What do you mean I don’t have a slip and fall case? I fell on their property! If you are invited onto your neighbor’s property and he is aware of a foot-deep sinkhole on his property which is obscured by high grass, he may be liable for damages if he does not at least warn you of a potential danger. Landowners, however, owe almost no duty of care to a trespasser. If you are injured while trespassing on another’s land, you are extremely limited in your ability to make any recovery. If you are a licensee, or a person who is on the land with express or implied permission of the landowner, the landowner has an obligation to advise you of any known dangers that are not obvious or visible to the licensee. There is a the duty of a landowner to warn a business invitee, customer or person invited on to the property for the purpose of profit of any danger. A business owner is responsible to inspect his or her own property for defects. He is also responsible for the correction or repair of any defects and to warn invitees of any dangerous conditions which may not be open and obvious to them. The specific situations under which these principles apply are too numerous to begin to catalogue for this article. Additionally, there are numerous specific rules like building codes, or applicable laws such as the “Americans with Disabilities Act” which may affect a particular situation. What about slip and falls on snow and ice? In Pennsylvania, the courts have specific rules that apply to slip-and-fall accidents under wintry conditions. Because snowy conditions are so prevalent in the winter, Pennsylvania has developed the “hills and ridges” doctrine. This doctrine essentially states that, in order to recover against a possessor of land for a snow-related fall, the injured person must show the fall was caused by an accumulation of snow and ice that has been there so long as to form “hills and ridges.” The reasoning is that those conditions were there result of neglect. Thus, if a person falls on “black ice,” there is typically no recovery permitted. However, if the black ice formed because of an unnatural condition (e.g. a defective sidewalk), there is a possibility a cause of action. Again, there are numerous rules which apply to particular situations. For instance, the City of Erie has a local ordinance which requires a possessor of land to clear sidewalks within 3 hours of the end of snowfall. 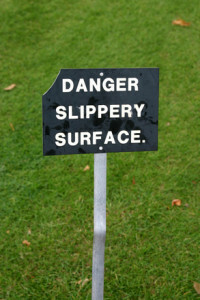 If you are injured in a slip-and fall accident, you should try to preserve the evidence as quickly as possible. Take pictures of the scene to preserve the evidence of the conditions at the time. If you fell on a wet floor in a business, take pictures of the wet floor and the absence of “wet floor” signs. The most important thing if you have a slip-and-fall case is to quickly hire a lawyer. The lack of knowledge of the applicable law and the steps necessary to protect a claim could make the difference in whether or not you have a case. Our Erie, PA lawyers offer free consultations to slip-and-fall victims. Am I Entitled to a Lump Sum Workers’ Compensation Settlement?